Free sticker packs for WhatsApp - Images into sticker pack for whatsApp! Free sticker packs for WhatsApp app helps you to create sticker packs for WhatsApp, which can be used for messages & sharing sticker’s packs. Would you like to create your own stickers for WhatsApp, Whatsapp stickers app allows to Create Your Own Sticker Pack for messenger also. Best stickers for whatsapp App show you the path to find best stickers & create your own stickers package within an Android or iOS, Open any individual chat and add sticker packs by taping on Emoji. Turn your own image into stickers. Send any image from your phone by a tap on new sticker button, send New Year, birthday wishes or festival greetings to your family and friends by using this WA Stickers App. Festival stickers: Are you searching for festival stickers for whatsApp? 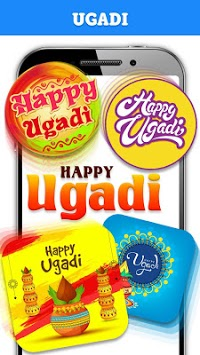 Thousands of festival stickers with designs for whatsapp for various seasonal festivals. Happy Valentine Day! Valentine Day Stickers to express your love with Special Stickers, Download the Collection of amazing Valentine Stickers for Whatsapp. 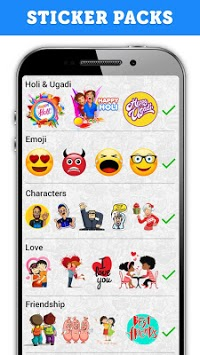 Emoji stickers: Huge collection Of funny status messages, Spread emoji fun with high quality Emoji stickers for Whatsapp, Check out Stickers in WASticker Apps the Most Popular emoji of 2019 and more at stickers for whatsapp app. Are you looking for Funny Stickers for whatsapp? Send Funny Stickers to people and have Whatsapp funny chats with friends, humor and laughter stickers are getting only here. Tags stickers: Choose beautiful selection of Tags stickers & Use different tags in your messages. Love stickers: stickers on love subject in New WhatsApp stickers App. Add popular Love Stickers and express your love when you are chatting with your friends. Happy birthday stickers: Best happy birthday stickers Free! Share Happy Birthday Stickers to your friends and relatives. •	Sticker of different categories. •	Valentine day Stickers Pack. •	WhatsApp sticker for festival. How to add the Stickers to WhatsApp? •	Install this sticker packs for WhatsApp application. •	Choose your favorite Sticker pack. And click on the pack. •	Click on "ADD TO WHATSAPP" button. •	Congratulation! The Stickers will be added to WhatsApp. 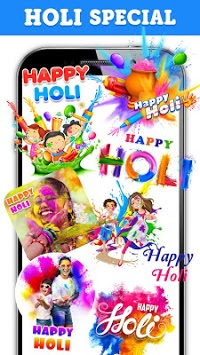 •	Send Variety of Funny, love, Valentine’s Day and Festival Stickers to Friends and Family. This Ultimate Pack has everything: animation, recently included WhatsApp Stickers for happy birthday, festival, funny, valentine etc. Download the best WhatsApp sticker apps for Android and iPhone, make custom whatsapp sticker packs for free to use in chat.